Live Oak Stud has enjoyed a storied history of standing stallions. While there are currently no stallions standing at the farm, the door is open to stand stallions again in the future. One of the first stallions in that storied history to stand at Live Oak Stud was Medieval Man, a homebred who was a three-time stakes winner and graded stake-placed performer. Medieval Man sired many stakes winners of his own, including successful broodmares Silk Stocks and Evil Elaine, the dam of champion Favorite Trick. With Approval arrived at Live Oak Stud to stand stud in 1991 after winning the Canadian Triple Crown in 1989 and being named Canada’s 3-year-old Champion and Horse of the Year. The gray or roan son of Caro (Ire) was an immediate success in Florida, remaining at Live Oak Stud through 1996. 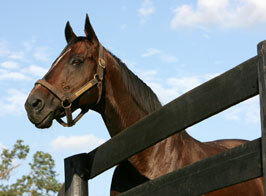 In that span he sired 25 stakes winners. 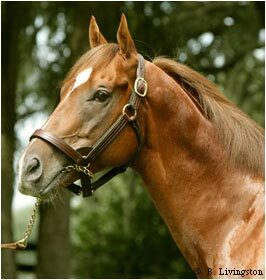 Other Live Oak Stud stallions have included the likes of Dispersal, Hesabull, Eltish, Sultry Song, Miesque’s Approval and High Fly, the 2005 Florida Derby winner who was the most recent stallion to stand at the farm through 2008. Live Oak Stud owns shares in various top stallions that stand in Kentucky.